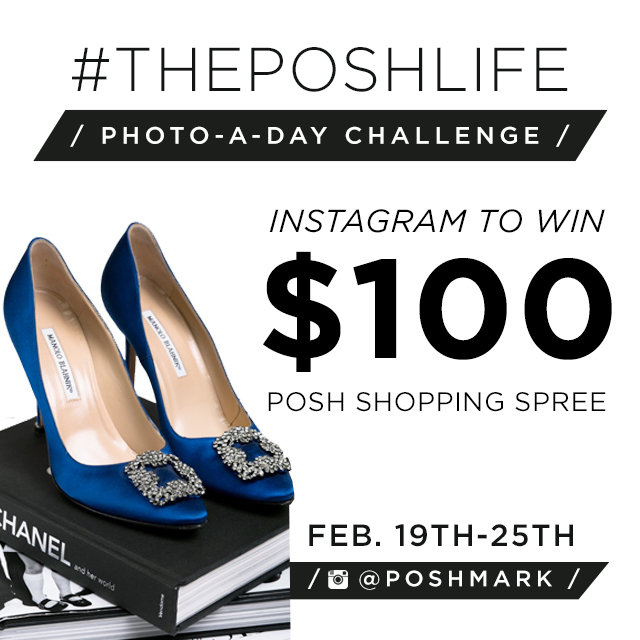 February 18, 2015 Categories Communitycontest, instagram, promotion, theposhlife2 Comments on Live #ThePoshLife & Win! There’s nothing more fabulous than the life of a Posher. So let’s celebrate #ThePoshLife! That’s right, we’re back with another Instagram photo-a-day challenge starting tomorrow, Thursday, Februrary 19th. Each day, snap a stylish shot inspired by the day’s prompt and share it to Instagram. Don’t forget to tag @Poshmark and include #ThePoshLife in each day’s caption to be entered to win a $100 Poshmark shopping spree! One winner will be selected at random on February 26th. While you don’t have to join in every day to be entered, where’s the fun in only posting once? Qualified entrants must use original photos, have a publicly visible profile, follow Poshmark’s Instagram account and be a U.S. resident. Ready, set, Insta! Can’t wait to do this!! !